There was a time, not too long ago, when it was rare to see a player from this province playing major junior or college hockey – let alone skating in the NHL. 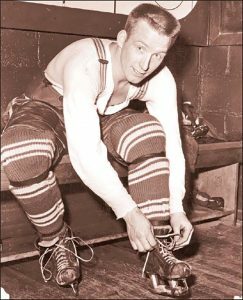 Alex Faulkner, the blonde haired kid from Bishop’s Falls, paved the way for a generation in the early 1960s to become our first NHLer and, well, almost 30 others have followed in his footsteps over the past half century. It’s incredible just how far this province has come since Faulkner skated with the Leafs in 1961. St. John’s native John Slaney agrees. The former NHL blueliner, best remembered for scoring the winning goal for Canada against the Russians at the 1991 world junior championship, was one of only a handful of players from this province to toil in the major junior circuit in the late 1980s. “I certainly felt the pressure at the time because there was only a few of us playing away. But I also felt a lot of pride to represent our province on the mainland,” recalls Slaney, an all- star rearguard for the OHL’s Cornwall Royals before turning pro. Much has changed since then. Heck, during the 2010-11 NHL season, there was a half dozen players from this province on big league clubs, and playing big roles on their respective NHL teams. 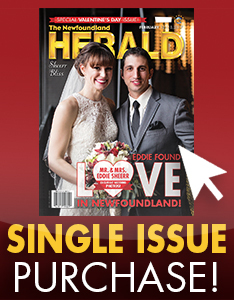 The opportunities are endless for today’s young stars, and you only need to look at The Telegram’s weekly ‘Newfoundlanders Away’ statistical feature to see just how far we’ve come. Almost 100 athletes from this province, men and women, are playing junior hockey, college and pro, from the minors to the NHL. 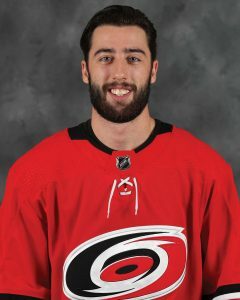 Clark Bishop of St. John’s, just 22, has appeared in 20 games with the Carolina Hurricanes this season, while Mount Pearl goaltender Evan Fitzpatrick, 20, earned a call-up to the St. Louis Blues. Unlike the days when Slaney toiled in the OHL, there are a dozen players from this province currently skating in the Quebec Major Junior Hockey League circuit. A few of them are putting up big numbers. Dawson Mercer of Bay Roberts, 17, has 43 points in 42 games (as of press time) with the Drummondville Voltigeurs. Brett Budgell of St. John’s has 15 goals in 40 games with the Charlottetown Islanders, while Matthew Grouchy of Labrador City has an impressive 27 points through 37 games. The Maritime Junior Hockey League is filled with talent from Canada’s youngest province with 25 players competing for various teams in the circuit. But no player from this province is more touted than St. John’s native Alex Newhook, the star forward with the BCHL’s Victoria Grizzlies. The 17-year-old phenom is one of the game’s top prospects and is expected to go in the first round of this summer’s National Hockey League Entry Draft. Hockey insiders have him going as high as 13th overall. “I try not to think too much about that (draft) right now. My main goal is helping the team and improving my game,” says Newhook, selected the league’s top rookie last year. His opportunity to leave home came early. 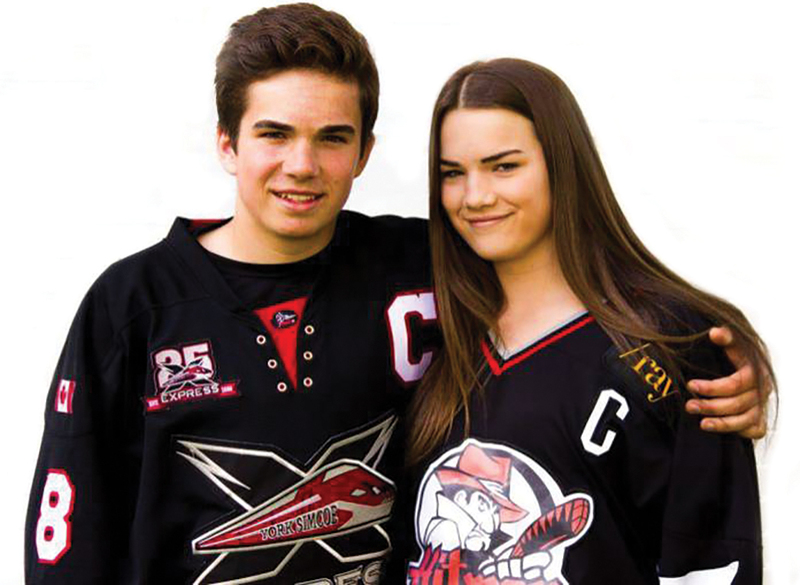 Newhook spent two years with the York Simcoe Express, captaining the Minor Midget AAA team in 2016-17, catching the eye of major junior scouts. In fact, he was selected 41st overall by the QMJHL’s Halifax Mooseheads. “I thought a lot about my decision but I knew what I wanted,” says Newhook, the BCHL’s top scorer so far this season. The decision, of course, was to pursue the U.S. college route over the Canadian Hockey League. He’s expected to star for Boston College next season. “I can’t wait,” says Newhook, who recently played for Canada at the 2018 World Junior A Challenge. Newhook won’t be the only Newfoundlander playing college. Four players from this province are currently playing NCAA, including another division one player (Adam Dawe of Gander). “I think it’s the smart choice to play at Boston College and get my education,” says Newhook, acknowledging local NHLers who went the same route – Colin Greening (Cornell), Teddy Purcell (Maine) and Dwayne Norris (Michigan State). Alex, of course, isn’t the only Newhook pursuing the college hockey dream. His little sister Abby, just 15, has already committed to play hockey for Boston College in 2021. 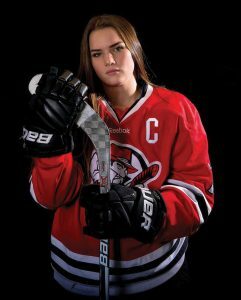 She’s currently playing prep school hockey in the U.S. and is considered one of the best female hockey players in the nation. There’s also Maggie Connors of St. John’s, currently averaging over a point per game in her freshman season with Princeton. A star on the national under-18 team last year, Connors helped Shattuck-St. Mary’s prep school win USA Hockey’s under-19 national women’s championship earlier this year. It was the third straight U-19 national title for Shattuck, the Minnesota prep school which helped groom Sidney Crosby, Nathan MacKinnon and Jonathan Toews, among others. Last week, Connors was named both the top player in the ECAC and in NCAA Division 1 women’s hockey, a huge accomplishments. Connors isn’t the only player from this province with a top-10 ranked team in NCAA Division One women’s hockey. Amy Curlew of Happy Valley-Goose Bay plays defence for the Cornell Big Red, who were seeded fourth until a loss last weekend to Princeton. She isn’t the only female player from this province making a big impact on Team Canada. 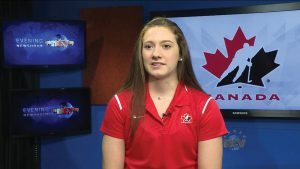 Last week, the national under-18 team played at the world championship in Japan and the club featured 17-year-old Shailynn Snow of Clarke’s Beach. The talented young star actually helped Canada win gold, a 3-2 overtime win over the U.S. in the final. Snow is in her third season at Ridley College in Ontario, where she captains the girls’ varsity team. She’s committed to attend St. Lawrence University in Canton, N.Y. on an NCAA scholarship. Yes, much has changed since Faulkner walked into the Leafs’ dressing room in December of 1961, becoming our first NHLer. Well, there’s plenty of opportunity for today’s star players, from Canadian and American universities to prep schools and junior clubs all over North America. And with about 100 players currently toiling in leagues all over the world, you can expect to see the number rise.